The Greek islands are among the most popular honeymoon destinations around the world. Every year, thousands of couples hop either by ferry or plane to the Greek islands and spend their honeymoon in a fantastic location, gazing at the blue sea and the romantic sunset. Here are our top Greek islands for honeymoon that we suggest. Santorini could certainly not miss the list with the top Greek islands for honeymoon! This is the most popular Greek destination, world famous for the gorgeous caldera, the impressive villages on the cliff top and the romantic sunset, especially from the village of Oia, the northernmost village of Santorini. The island took its present form after an enormous volcanic eruption that took place in 1,650 B.C. Today, the top of the volcano is visible in the centre of the sunken caldera and can be visited by boat from the old port of Fira. With many luxurious hotels lining up the caldera cliff and offering fantastic sea view, Santorini is a top island for honeymooners in Greece! How to go to Santorini: Visitors can go to Santorini by ferry or plane. There are ferries to Santorini from Athens (ports of Piraeus and Rafina), Heraklion in Crete, and many islands of Cyclades, like Mykonos, Paros, Naxos and more. The airport of Santorini also receives internal flights from Athens, Thessaloniki and many direct flights from abroad. Although Mykonos is famous as the island of the youth and vivid nightlife, it also has a very romantic and picturesque atmosphere, making it among the top Greek islands for honeymoon. Mykonos charms visitors at first sight with the picturesque quarter of Little Venice, the old windmills on the hill top, the traditional Cycladic architecture and the fantastic beaches on the southern side. Couples can pick a hotel with romantic style and sea view, even a room with its own pool or Jacuzzi for more private moments. Spend all day at the beach and in the evenings walk around the paved paths of Mykonos Town, shop at the many tourist shops that stay open until midnight or have a drink at the many bars and clubs that do not close before the early hours. How to go to Mykonos: Mykonos island can be reached by ferry or plane. Ferries to Mykonos depart from Athens (ports of Piraeus or Rafina), Heraklion Crete, and various islands of Cyclades, like Santorini, Paros, Naxos, Tinos, Andros and more. The airport of Mykonos receives internal flights from Athens, Thessaloniki and many direct flights from abroad. The romantic Medieval atmosphere fairly ranks Rhodes among the top Greek islands for honeymoon. The Old Town of Rhodes, frequently featuring in world travel magazines as one of the best-preserved Medieval towns in Europe, is an amazing place to stroll around day and night. In the daytime, people can visit the Palace of the Grand Master and the interesting museums of the town, while in the evenings they can go shopping or clubbing around the popular Hippocrates Square, the centre of Rhodes Old Town. The fantastic beaches and interesting sightseeing of Rhodes island complete the scene for a honeymoon destination in Greece. 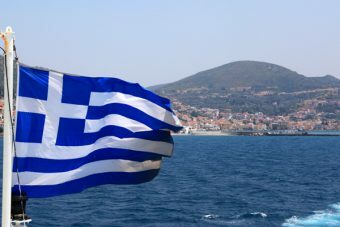 How to go to Rhodes: Ferries to Rhodes depart from Piraeus port in Athens, passing through many other islands. There is also ferry to Rhodes from Heraklion Crete three times per week. 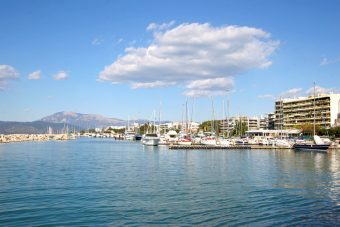 The airport of Rhodes receives flights from Athens, Thessaloniki and direct flights from abroad. Walking through the Old Town of Corfu is like walking in Florence or Venice, Italy. Due to the long occupation by the Venetians in the Medieval times, the architecture of Corfu has been strongly influenced by the Italian style. This romantic atmosphere, completed with lush greenery, cozy beaches and luxurious accommodation, makes Corfu among the top Greek islands for honeymoon. How to go to Corfu: Located on the western side of Greece, there is frequent ferry connection between Corfu and Italy. Ferries to Corfu from Italy depart from the ports of Bari, Brindisi, Ancona and Venice. There are also ferries to Corfu from the Greek mainland ports of Igoumenitsa and Patras. The airport of Corfu receives internal flights from Athens, Thessaloniki and many direct flights from abroad.